Villa Senang comprises a large living room, open plan kitchen and four spacious bedrooms and three bathrooms. Two of the bedrooms have seas view and doors opening directly onto the terrace. All bedrooms are equipped with air conditioning. The villa also has a hi-fi system, to which you can connect your iPod or MP3 player. Wireless internet is available. The covered terrace with large dining table is the ideal place to enjoy your meals, read a book or play boardgames. The big terrace next to the swimming pool has lounge chairs. One of the bathrooms is equipped with an outdoor shower. The open plan kitchen is equipped with all the mod cons and a fresh drinking water system. The villa has three double bedrooms and one single bedroom. There is ample storage for your clothes and shoes. The walls of the rooms are adorned with decorative old school plates and photographs depicting the Netherlands East Indies in the early 20th Century. The garden offers ample space for a game of football, or to unwind in the shade of the palm trees or the bale benong. Fresh herbs and fruit can be picked staight from the trees and bushes. In the garden, overlooking the sea is the bale benong. This is a kind of oriental lounge spot, where you can relax and enjoy the view over the beach and the sea. Especially at sunset this is the place to be. The private swimming pool is 15 meters long and features an ‘overflow’ to the beach. Alternatively, you may prefer to swim in the sea. For your own safety, please wear wetshoes as there may be pebbles on the beach. The garden opens directly onto the beach and the sea. The garden shower is ideal for washing off the salt water after your adventures in the sea. Our library features a wide selection of books about Bali. These unique books cover everything from Balinese history to culture, tourism and the colonial period. 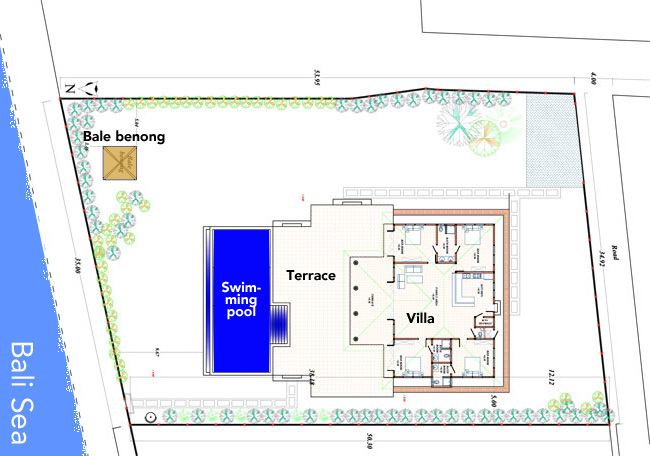 Plan of Villa Senang and it’s garden. Where is Villa Senang located?